Huawei had surprised everyone when it launched a notebook "Huawei MateBook" on 26th May, it is a tablet with a detachable, faux-leather cover/keyboard hybrid, which positions it as a direct Surface/Surface Pro competitor. It will be awesome to download and play YouTube videos on Huawei MateBook 12-inch display retina. In following article, we will introduce a free but powerful Huawei MateBook Online Video Downloader --- Any Video Converter Free. As a free YouTube Video Downloader, Any Video Converter Free allows you to download and play Youtube videos to Huawei MateBook with original quality kept. Simply free download this YouTube Video Downloader for Huawei MateBook, and enjoy YouTube videos on your Huawei MateBook offline. Step 1. Add video urls and start downloading YouTube videos for Huawei MateBook. Go to YouTube or your favorite video site and search for the videos your would like to download. Copy the YouTube video download link from YouTube webpage. Click on the Add URLs button, then a dialog will pop up, just click icon, and paste the download link to it. You can continue to paste more YouTube video links as the previous steps. Then Press Start Download! button to begin downloading. Note: To avoid downloading YouTube videos which have non-English file name not being recognized by the converter, please click button in the upper right corner of the main window and press Online Video Tab and then uncheck "Use HTML Title as output file name" option before downloading. 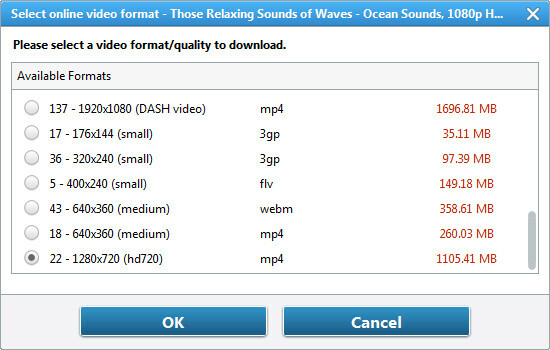 Under Select Format, you can choose Manually Select, Best Quality, Smallest File Size for your downloaded YouTube videos. When you choose "Manually Select", you will get a window pop up thus you can choose the video format you need.